Vietnam, in all honesty, wasn’t high up on my travel bucket list, so I was pleasantly surprised when Hanoi blew away my expectations and became one of the cities I want to revisit the most. We started Hanoi off with a wild taxi ride from the airport where our driver spent more of his attention taking never-ending phone calls instead of the road. 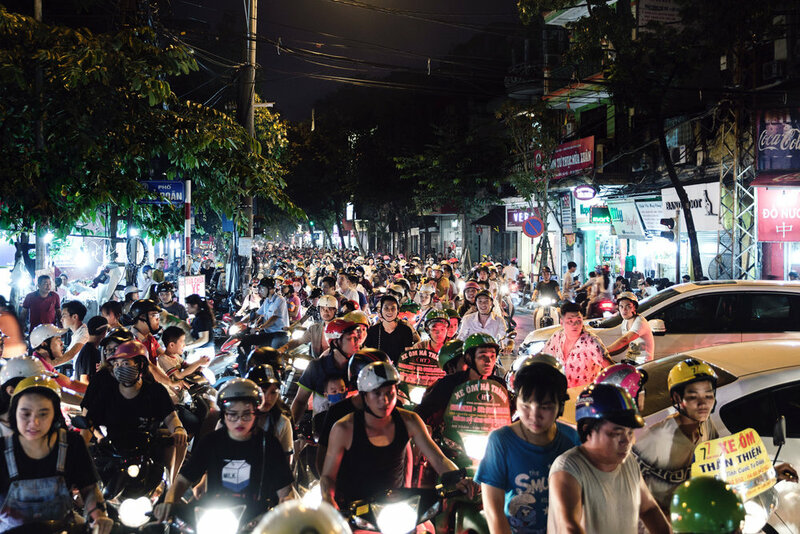 Streets in the city are similar to many other places in Asia - to describe them as chaotic would be an understatement. 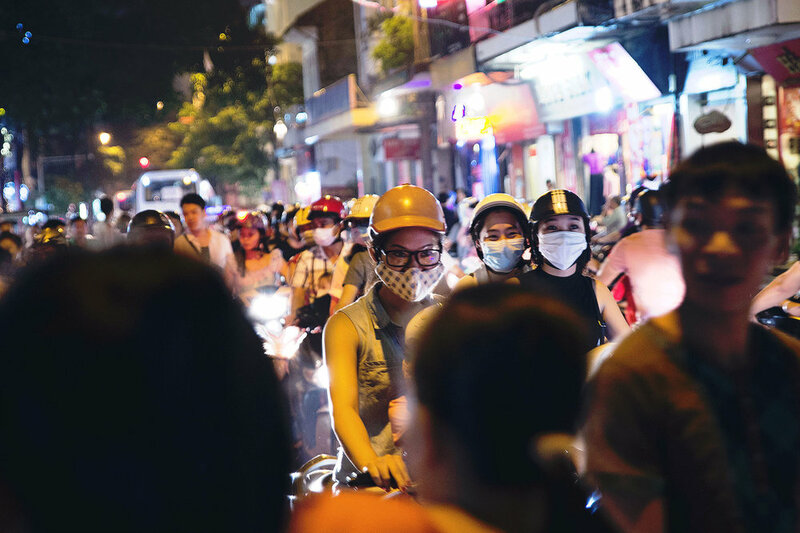 Navigating Hanoi's definitely requires some getting used to, and a lot of times it's hold your breath, pray you don't get hit and just walk. No exaggeration. We stayed at the Noble & Swan Boutique Hotel, a centrally located hotel in the Old Quarter. Upon checking in, a staff member sat us down and recommended some local eats. I had thought it was some business partner plug, but my skepticism disappeared entirely after that first bite of pho (I wrote about it below). The hotel staff were some of the most genuinely kind people ever. One staff member even came outside as we were heading out for the day to shake our hand and explain that she would be off on our check-out day and she wanted to say thank you and goodbye. I'll definitely consider staying here again next time. The area near the Ngoc Son Temple part of the Hoan Kiem Lake area is quite picturesque in the evening. It was a Friday, and the entire lakeside area was lively with people hanging out, enjoying food and just having some fun. In other parts of the Old Quarter as well, friends gathered on little plastic stools along the sidewalks to eat and have drinks. This was a common sight everywhere we walked. The vibe of the city and its people are what I really enjoyed about Hanoi... of course the food too, which I'll get to later. It's a city that has both a busy and laid back feel at the same time. Mopeds, some with as many as a family of 6 on them, zoom by constantly. It has that endless buzz of traffic and bustle, yet people are laid back, hanging out outside cafes with friends at all hours in the day, even during work hours which I found to be interesting. Most people seemed to be polite and a little reserved, and we had no issues with any attempts to rip us off or anything like that. 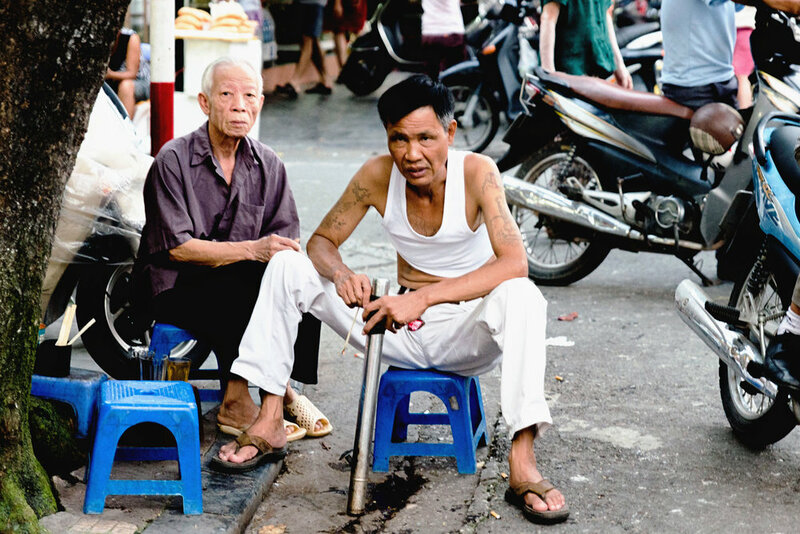 The central part of Hanoi is really walkable, and there's a lot you're constantly taking in. Because of that, this trip was the first time I consciously dabbled in any kind of street photography. Most locals tended to shy away from having their photo taken though, so I tried not to intrude too much. 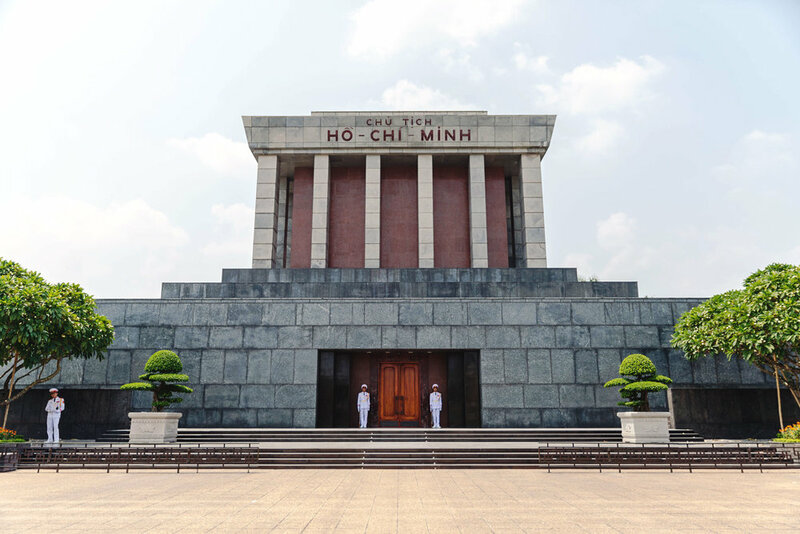 The only time we decided to give our feet a rest and catch a cab was visiting the Ho Chi Minh mausoleum, which sits just west of the Old Quarter area. You could sense the weight of its importance, from its vast grounds and guards to the design of the structure itself. 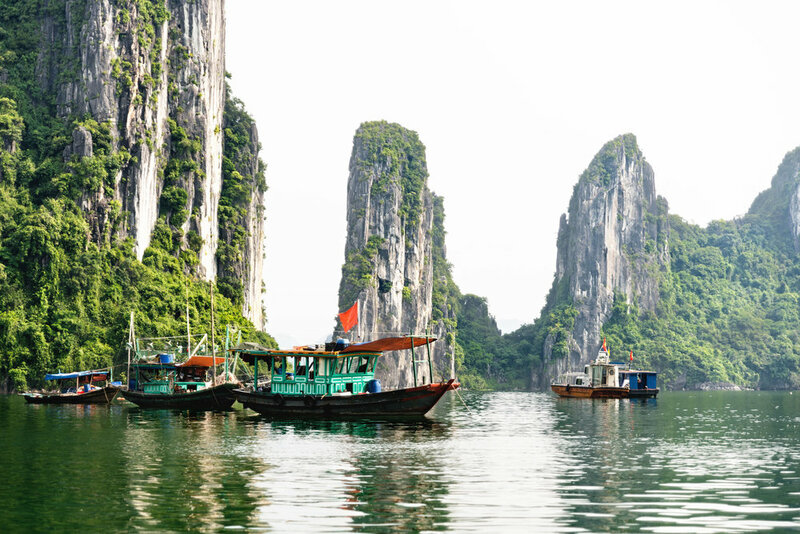 Before visiting, my list of things I wanted to see and do in Hanoi was as long as maybe a few scribbles on a hotel notepad, but I left with the feeling that I needed more time. There are so many alleys or shops that continually make themselves known while you're there, and I feel the need to go back, venture around and witness life there a little more. And finally, the food. I'm not knowledgeable about Vietnamese cuisine, but there were some things that I ate in Hanoi that I seriously couldn’t get enough of. Everything we ate and drank was tasty, super fresh and affordable. And in a city that continuously sparks curiosity? Can't ask for much more. Pho-king delicious. This was the best bowl of pho that I've ever eaten. Period. While there were some tourists, Pho Gia Truyen was packed with mostly locals - a good sign. It's a casual, open eatery with half of the guests eating outside on little purple plastic tables and chairs packed in every open space on the sidewalk. They have a few different bowls to choose from, I went with their premium one which came out to less than $3 USD. Each bite was so savory, I really can't say enough about about it. I had never heard of bun bo nam bo, and while I can't remember a lot of Vietnamese words, I won't forget this one. This bowl of stir fried beef, vermicelli rice noodles, lettuce, bean sprouts, fried onions, chopped peanuts and more mixed in with some tangy yet citrusy sauce with a kick to it was simply amazing. It was a party of flavor in your mouth for a couple bucks US and absolutely amazing. Che 4 Mua (Tea 4 Seasons in English) is a popular dessert spot. Seating is mostly on the sidewalk on little plastic chairs, but staff come by to talk and help you with your order. It was a warm evening so we just went with cold drinks, watching the kitchen scoop fresh fruit into the glasses and create our dessert drinks from almost scratch. The drinks were served slightly chilled and flavors were completely natural and clean. Very refreshing.